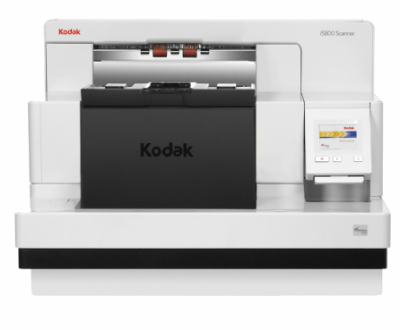 The KODAK i5850 Scanner was created to triumph over the many processing challenges faced by digital mail rooms, multinational financial and insurance services firms, manufacturing organizations, government entities, and others that process huge volumes of documents containing diverse varieties of information. We've designed the i5850 Scanner with greater capability and versatility to help meet demanding business goals. Image addressing to read patch codes, Intelligent Document Protection (IDP) to safeguard valuable documents, and a rear post-scan printer. A customizable, intelligent, ergonomically correct production scanner, the i5850 features KODAK Dynamic Flow Technology. This advanced digital architecture delivers optimized memory allocation and processing paths. Now you can work smarter with breakthrough solutions from Kodak Alaris, the high-volume market leader. Programmable function keys eliminate repeated set-ups of complex tasks and make scanning "one-button easy"
Optional KODAK Controlled Dual Stacking Accessory automatically separates patch sheets, images checks and correspondence in a single step – so you can re-use sheets and gain other productive advantages.